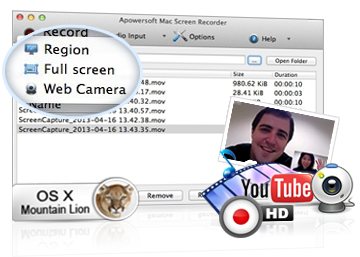 Apowersoft Mac Screen Recorder is a flexible, all-in-one, award-winning software with an advanced screen recorder, smart video converter and built-in video editor. With this Mac OS screen recorder, you can capture videos of an entire screen, a selected region or around the mouse. Plus, you can record web camera to create amazing picture-in-picture videos. After recording, it automatically outputs MP4 video files so you can upload to YouTube directly. Additionally, you can convert them in batches to different formats like AVI, MP4, FLV, SWF, MKV, and many others, with zero quality loss. Rating: 4.5 - based on 91 ratings. Cool. OBS, FoneLab, Monosnap are also good options to record video with audio. They can work on Windows and Mac. As for recording quality, I think FoneLab does better.